A recent article (http://yourtradingcoach.com/trading-process-and-strategy/reader-trade-review-es-test-of-resistance/) included the following image, which led to an email question asking "how do you display both price and the tick in the one chart, instead of in two separate windows?" Scroll down to the video titled "Adding Indicators to a Chart based upon Different Timeframes"
You do not need the whole video… just the first 1:25 minutes. Note in this video how the presenter adds two data series to a single chart window – an ES 1 minute chart and an ES 5 minute chart. Follow the exact same procedure adding two data series, the first being the market you wish to display and the second being the NYSE Tick. 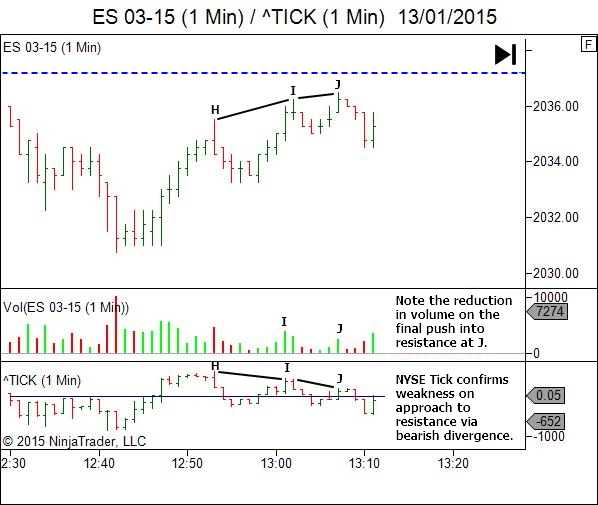 So in my previous article I displayed two data series – ES 03-15 (1-min) and ^TICK (1-min).